If I were attempting anything like an appraisal of Herbert Croly I should say, I think, that he was the first important political philosopher who appeared in America in the twentieth century. I should say that “The Promise of American Life” was the political classic which announced the end of the Age of Innocence with its romantic faith in American destiny and inaugurated the process of self-examination. That is, of course, the opinion of a very grateful friend; yet I believe it will be justified when our history is sufficiently distant and neutral to be interpreted. It would be presumptuous for me to attempt to demonstrate this opinion now. I was closely associated with Herbert Croly for nearly eight years and I should like to set down a few notes which may give his biographer the clue to significant events at certain important junctures of his life. The New Republic was founded to explore and develop and apply the ideas which has been advertised by Theodore Roosevelt when he was the leader of the Progressive party. Roosevelt ran in 1912; the general plans of The New Republic were worked out by Croly and by Mr. and Mrs. Straight in 1913. Towards the end of 1913 Croly selected the first board of editors—Walter Weyl, Francis Hackett, Philip Littell and myself. We spent the winter of 1913-14 preparing for publication in early autumn. We started, in other words, on the assumption that we were enlisted as loyal, though we hoped critical, members of the Progressive movement. We thought that movement was established. We thought that Roosevelt would continue to lead it. We never dreamed that there would be a World War before our first issue was printed. All the editors were to be free and equal, although in fact Croly was the editor-in-chief. In the preparatory stages we settled everything that seemed interesting by agreement of the whole board; when we really had to face the business of issuing the paper every week we became more or less separated in fact, though never wholly in theory, into separate departments. Francis Hackett, who had edited the most brilliant literary supplement in America for The Chicago Evening Post, became the literary editor. Philip Littell invented his own department, “Books and Things.” It turned out to be the patrician father of a whole race of newspaper columns. Miss Charlotte Rudyard was a kind of assistant managing editor. Robert Hallowell combined the duties of business manager and art editor. Walter Weyl, Croly and I did most of the political writing. We were joined somewhat later by Alvin S. Johnson. Of the four of us, Croly and Weyl had been especially close to Roosevelt in his Bull Moose days. Croly had, I think, made articulate for Roosevelt his aspiration to combine the social and political reforms initiated by Bryan and La Follette with a Hamiltonian affection for a strong national government. Most of the philosophy came from Croly, and I think also the name by which it was then known. It was the New Nationalism. Weyl was essentially an economist and social reformer rather than a political theorist, and it is interesting that the book which was his contribution to the progressivism of those days was called not the New Nationalism, but “The New Democracy.” Croly and Weyl had no difficulty in agreeing, but each had a different emphasis. Broadly speaking, Croly was in the tradition of Hamilton, Lincoln, the Unionist and Roosevelt the Progressive, whereas Weyl was in the tradition of Jefferson, the Abolitionists and the Wilson Democracy. The trouble we had finding a name for the paper illustrates what I am saying. Croly’s first choice—the name he really wanted—was The Nation. It seemed to him the perfect name for the paper he wished to publish. That was, of course, before Mr. Villard took over The Nation, in the days when its old glories had faded and it had not yet been reborn. The name was preempted, and so after much debated we picked the nearest approximation and called the paper The Republic. It was The Republic for some weeks in our preliminary advertising, and then suddenly another The Republic turned up. Its habitat, I think, was Boston; its circulation was exclusive—largely, I seem to recall, among the followers of Honey Fitz—and its publisher was righteously angry at our attempt to steal his name. We had to differentiate ourselves, and so with a positive dislike for the suggestion of utopianism, we called the paper The New Republic. Before we got under way the War broke out in Europe, and like most of the rest of mankind we found that we had to improvise a new philosophy on very short notice. We guessed wrong a number of times, and on some points, I think we guessed right. Among the things we were clear about and also right was that the war in Europe marked the end of American isolation and that the business of neutrality was played out. Croly’s statement of that position in the first issue, which appeared in November, 1914, was astonishingly prophetic. The much debated question of why The New Republic supported American participation in the War is answered right there. Croly was never a pacifist in the sense that Mr. Villard, for example, is a pacifist, and although in later years he came to have very deep doubts about America’s part in the War, in the years 1914-17 there was never any question in his mind, I think, that under certain circumstances, such as the threat of German victory, it would be necessary for America to enter the War. The position which the paper assumed resulted in giving me my only experience of what it feels like to be offered a bribe. A distinguished English publisher arrived at the office and stated that if we would promise to produce an article a week in the same vein he was prepared to buy fifty thousand copies a week for the duration of the War. Thus we learned rather early in the War that in addition to the German propaganda there was an Allied propaganda. Our general position at the outset delighted Roosevelt and we saw a good deal of him in the first few weeks. We were highly critical of Wilson, contemptuous of Bryan, who was Secretary of State, and Roosevelt had not yet decided that Wilson should have intervened in the War in August 1914. Then suddenly we had a falling out with Roosevelt. He was attacking Wilson and Bryan all along the line and particularly for their Mexican policy. One day he let loose a blast charging them, as I now recall it, with having failed to avert certain atrocities committed in Mexico. It seemed to us a brutally unfair attack, and though we disliked Wilson’s Mexican policy, we criticized Roosevelt sharply. He reproached us bitterly and never forgave us. After that we never had any close personal association with any public man. Our relations with Wilson were never personal. I don’t think Croly ever saw Wilson when he was President; in the winter of 1916 I had two or three interviews, such as any journalist has with the President. Croly and I did begin to see something of Colonel House. It was a curious relationship. Wilson was preparing to run for his second term; his main problem was the management of American neutrality. We discussed the problem perhaps once a fortnight with Colonel House. He never told us what the President was going to do. We never knew anything that hadn’t appeared in the newspapers. In our minds we followed the logic of the situation as we saw it. Partly by coincidence, partly by a certain parallelism of reasoning, certainly by no direct inspiration either from the President or Colonel House, The New Republic often advocated polices which Wilson pursued. The legend grew that The New Republic was Wilson’s organ, and once to our intense surprise the stock market reacted when an issue of The New Republic appeared on the news stands. The paper was never the organ of the Wilson administration. We never knew any secrets, we never had a request to publish or not to publish anything, and we were not in a confidential relationship. Colonel House made it his business to see all kinds of people, and we were among the people he saw. Occasionally the President and Colonel House took an idea from The New Republic as they took it from many other sources. Once the President horrified us by appropriating a phrase and employing it in a sense we had never intended. In analyzing the peace offer made by Bethmann-Hollweg in December, 1916, we had said entirely by way of description and analysis, that the proposal was an offer of “peace without victory.” We did not like the offer ourselves and did not mean to praise it. A few weeks later the President produced an unroar by coming out as the advocate of a peace without victory. However sound the idea, the phrase itself, as I think Colonel House agreed, was inept. But it helped among other things to establish the legend of The New Republic as Wilson’s personal organ, a legend which was not dissipated completely until Wilson’s Postmaster-General contemplated suppressing the paper for advocating a Wilson peace in the mad days of 1918. We broke with Wilson the week after the Treaty of Versailles was published. I had been away from the paper during the War and had returned to it two or three months before the Treaty was concluded. The decision to oppose ratification was Croly’s. I followed him, though I was not then and am not now, convinced that it was the wise thing to do. That the Treaty was a deplorable breach of faith was clear; the question was whether the Covenant of the League was an instrument for perpetuating or for correcting the evils of the Treaty. We decided that it would perpetuate them if America ratified, whereas if America abstained, revision was inevitable because France did not have the power to enforce the Treaty. A strong case can be made for and against this view. If I had to do it all over again I would take the other side; we supplied the Battalion of Death with too much ammunition. One other incident occurs to me which is rather curious in retrospect. It is that we started Herbert Hoover’s presidential boom at the end of 1919. 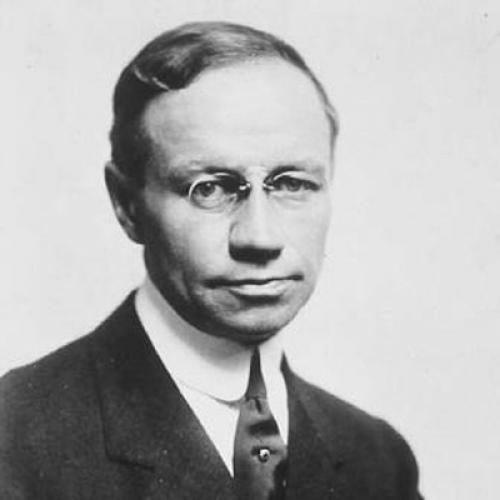 Our most important covert, or perhaps I should say our immediate successor, was Frank I. Cobb, the editor of The World. A few weeks after The New Republic had proposed Mr. Hoover for President, Cobb nominated him with such thunder that Mr. Hoover himself took it seriously, and after due deliberation pronounced himself a Republican by faith and conviction. Cobb always attributed and the legend in The World office is that when Mr. Hoover called up Cobb a few days later and said he wanted some political advice, Cobb replied, “Mr. Hoover, I am an expert on the grain market; Mr. Hoover is President, maybe Barnes was right. In any event The New Republic picked a President of the United States even if it misjudged the date by eight years. And if anybody wants to see the Hoover propaganda in its pristine form he can find it in the files of The New Republic. The most exhilarating experience we had, as I look back now, was the resistance of The New Republic in 1919 and 1920 to the Red hysteria. It is difficult today to remember the idiotic intolerance which descended upon the country in those days. Occasionally I have to turn back the files of old newspapers, and the things that were said and done by men now eminent for their sanity are unbelievable. It was the most disgraceful exhibition of general cowardice and panic which any of us is likely to experience. The New Republic stood firm and took its punishment, and the credit is Herbert Croly’s. He had the cold courage of a man who does not enjoy martyrdom. He was a brave and as imperturbable as any editor can hope to be. I have no pleasanter memory than of those days with Herbert Croly. This article appeared in the July 16, 1930 issue of the magazine.